Jharkhand State AIDS Control Society is ready to hire the applicants for the 07 available seats of Counsellor, Medical Officer Jobs as per the JSACS Recruitment 2017 advertisement published on department web portal. Job seekers who have required eligibility may apply through Offline Mode after reading all the details of JSACS Recruitment 2017 through this section.You are needed to send the application form in the appropriate format at the below address till or before 10th July 2017. Education Needed : Candidates who are willing to apply for JSACS jobs must posses Post Graduation Degree from any recognized board or institution. Reserved category applicants will get the age relaxation as per JSACS norms. Emoluments given to Employee: Contenders who will be appointed successfully for JSACS Vacancy, they get the salary pay band of Rs. 13,000/- (Post 1), Rs. 45,000/- (Post 2), Rs. 36,000/- (Post 3) as per organization norms. Deadline to Submit the Application Is : 10-07-2017. Click Here For JSACS Official Notification Link. Assam Forest Department is ready to hire the applicants for the 90 available seats of SRPF Constable Jobs as per the Assam Forest Department Recruitment 2017 advertisement published on department web portal. Job seekers who have required eligibility may apply through Online Mode after reading all the details of Assam Forest Department Recruitment 2017 through this section.Candidates who meet the eligibility criteria and interested to apply they can submit their application form before the last date that is 21st July 2017. Education Needed : Candidates who are willing to apply for Assam Forest Department jobs must posses 12th from any recognized board or institution. Reserved category applicants will get the age relaxation as per Assam Forest Department norms. Emoluments given to Employee: Contenders who will be appointed successfully for Assam Forest Department Vacancy, they get the salary pay band of Rs. 14,900 - 49,100/- plus 5600/- Grade Pay as per organization norms. Selection of the job hunters will be done on the basis of their performance in the Written Exam, Personal Interview, Physical Standards Test conducted by the selection committee. Starting Date of Online Application Form Filling Is : 05-07-2017. Deadline for Submitting Online Application Form Is : 21-07-2017. 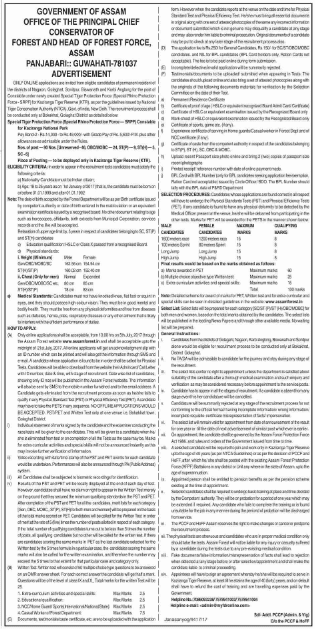 Jail Department Betul is ready to hire the applicants for the 06 available seats of Supervisor, Wireman, Tractor Mechanic Jobs as per the Jail Department Betul Recruitment 2017 advertisement published on department web portal. Job seekers who have required eligibility may apply through Offline Mode after reading all the details of Jail Department Betul Recruitment 2017 through this section.You are needed to send the application form in the appropriate format at the below address till or before 10th July 2017. Education Needed : Candidates who are willing to apply for Jail Department Betul jobs must posses 10th / 11th / Diploma / Engineering Degree / Graduation Degree from any recognized board or institution. The candidates who wish to apply for the available vacancy should be more than 18 Years. Reserved category applicants will get the age relaxation as per Jail Department Betul norms. Emoluments given to Employee: Contenders who will be appointed successfully for Jail Department Betul Vacancy, they get the salary pay band of Rs. 110/- per hour or Rs. 10,000/- per month as per organization norms. HLL Biotech Limited is ready to hire the applicants for the 21 available seats of Chief Operating Officer, Supervisor Jobs as per the HBL Recruitment 2017 advertisement published on department web portal. Job seekers who have required eligibility may apply through Online Mode after reading all the details of HBL Recruitment 2017 through this section.Candidates who meet the eligibility criteria and interested to apply they can submit their application form before the last date that is 10th July & 13th July 2017. Education Needed : Candidates who are willing to apply for HBL jobs must posses Graduation Degree / Post Graduation Degree from any recognized board or institution. The candidates who wish to apply for the available vacancy should not be more than 50 Years (Post 1), 35 Years (Post 2) As On 28-06-2017. Reserved category applicants will get the age relaxation as per HBL norms. Emoluments given to Employee: Contenders who will be appointed successfully for HBL Vacancy, they get the salary pay band of Rs. 43,200 - 66,000/- / Rs. 36,600 - 62,000/- (Post 1) as per organization norms. Online Registration Starts From : 28-06-2017. Dead Line For Apply Online : 10-07-2017 (Post 2) & 13-07-2017 (Post 1). Click Here For HBL Official Notification Link. HLL Biotech Limited is ready to hire the applicants for the 14 available seats of Manager Jobs as per the HBL Recruitment 2017 advertisement published on department web portal. Job seekers who have required eligibility may apply through Online Mode after reading all the details of HBL Recruitment 2017 through this section.Candidates who meet the eligibility criteria and interested to apply they can submit their application form before the last date that is 9th July 2017. Education Needed : Candidates who are willing to apply for HBL jobs must posses Engineering Degree / Post Graduation Degree / Diploma from any recognized board or institution. The candidates who wish to apply for the available vacancy should not be more than 45 Years (Post 1-3), 40 Years (Post 4-11) As On 28-06-2017. Emoluments given to Employee: Contenders who will be appointed successfully for HBL Vacancy, they get the salary pay band of Rs. 29,100 - 54,500/- (Post 1-3), Rs. 20,600 - 46,500/- / Rs. 16,400 - 40,500/- (Post 4,5), Rs. 16,400 - 40,500/- (Post 6-8,10), Rs. 16,400 - 40,500/- / Rs. 12,600 - 32,500/- (Post 9,11) as per organization norms. Last Date To Submit Online Application : 09-07-2017. Indian Institute of Astrophysics is ready to hire the applicants for the 11 available seats of Engineer, Research Trainee, Post Doctoral Fellow Jobs as per the IIAP Recruitment 2017 advertisement published on department web portal. Job seekers who have required eligibility may apply through Online Mode after reading all the details of IIAP Recruitment 2017 through this section.Candidates who meet the eligibility criteria and interested to apply they can submit their application form before the last date that is 19th July 2017 (Post 1-7), 28th July 2017 (Post 8). Education Needed : Candidates who are willing to apply for IIAP jobs must posses Engineering Degree (B.E/B.Tech) / Diploma / Post Graduation Degree (M.Sc/Ph.D) from any recognized board or institution. The candidates who wish to apply for the available vacancy should not be more than 26 Years (Post 1,7), 32 Years (Post 2-6), 36 Years (Post 8). Reserved category applicants will get the age relaxation as per IIAP norms. Emoluments given to Employee: Contenders who will be appointed successfully for IIAP Vacancy, they get the salary pay band of Rs. 20,000/- (Post 1,7), Rs. 50,000/- (Post 2-4), Rs. 40,000/- (Post 5,6,8) as per organization norms. Starting Date of Online Registration of Application Form Is : 21-06-2017. Dead Line To Submit Online Application Is : 19-07-2017 (Post 1-7), 28-07-2017 (Post 8). Click Here For IIAP Official Notification Link. Ordnance Factory Medak is ready to hire the applicants for the 100 available seats of Apprentice Jobs as per the Ordnance Factory Medak Recruitment 2017 advertisement published on department web portal. Job seekers who have required eligibility may apply after reading all the details of Ordnance Factory Medak Recruitment 2017 through this section.Candidates who have decided to build their career in this organization they can attend Walkin Interview which are going to be held On 25th July 2017. Education Needed : Candidates who are willing to apply for Ordnance Factory Medak jobs must posses Engineering Degree / Diploma from any recognized board or institution. Reserved category applicants will get the age relaxation as per Ordnance Factory Medak norms. Emoluments given to Employee: Contenders who will be appointed successfully for Ordnance Factory Medak Vacancy, they get the salary pay band of Rs. 4984/- (Graduate), Rs. 3542/- (Technician) as per organization norms. Date of Interview : 25-07-2017. Click Here For Ordnance Factory Medak Official Notification Link. Zilla Swasthya Samiti Balangir is ready to hire the applicants for the 03 available seats of Work Consultant, Block Programme Manager Jobs as per the Zilla Swasthya Samiti Balangir Recruitment 2017 advertisement published on department web portal. Job seekers who have required eligibility may apply through Offline Mode after reading all the details of Zilla Swasthya Samiti Balangir Recruitment 2017 through this section.You are needed to send the application form in the appropriate format at the below address till or before 7th July 2017. Education Needed : Candidates who are willing to apply for Zilla Swasthya Samiti Balangir jobs must posses Diploma / Engineering Degree / Post Graduation Degree from any recognized board or institution. The candidates who wish to apply for the available vacancy should not be more than 65 Years (Post 1), 21 - 35 Years (Post 2) As On 01-06-2017. Reserved category applicants will get the age relaxation as per Zilla Swasthya Samiti Balangir norms. Emoluments given to Employee: Contenders who will be appointed successfully for Zilla Swasthya Samiti Balangir Vacancy, they get the salary pay band of Rs. 26,460/- (Post 1), Rs. 19,845/- (Post 2) as per organization norms. Closing Date to Submit Hard Copy of Application Form Is : 07-07-2017. Click Here For Zilla Swasthya Samiti Balangir Official Notification Link. 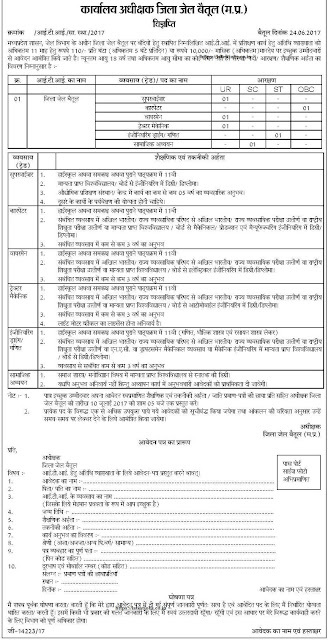 Energy Department Rajasthan is ready to hire the applicants for the Various available seats of Chartered Electrical Safety Engineer Jobs as per the Energy Department Rajasthan Recruitment 2017 advertisement published on department web portal. Job seekers who have required eligibility may apply through Offline Mode after reading all the details of Energy Department Rajasthan Recruitment 2017 through this section.You are needed to send the application form in the appropriate format at the below address till or before 31st July 2017. Education Needed : Candidates who are willing to apply for Energy Department Rajasthan jobs must posses Engineering Degree from any recognized board or institution. Reserved category applicants will get the age relaxation as per Energy Department Rajasthan norms. Click Here For Energy Department Rajasthan Official Notification Link. District e-Governance Society Dhamtari is ready to hire the applicants for the 01 available seats of e-District Manager Jobs as per the District e-Governance Society Dhamtari Recruitment 2017 advertisement published on department web portal. Job seekers who have required eligibility may apply through Offline Mode after reading all the details of District e-Governance Society Dhamtari Recruitment 2017 through this section.You are needed to send the application form in the appropriate format at the below address till or before 15th July 2017. Education Needed : Candidates who are willing to apply for District e-Governance Society Dhamtari jobs must posses Engineering Degree / Post Graduation Degree from any recognized board or institution. The candidates who wish to apply for the available vacancy should be existing between 21 - 35 Years As On 01-01-2017. Reserved category applicants will get the age relaxation as per District e-Governance Society Dhamtari norms. Emoluments given to Employee: Contenders who will be appointed successfully for District e-Governance Society Dhamtari Vacancy, they get the salary pay band of Rs. 23,500/-. as per organization norms. Closing Date for Forwarding Filled Application Forms : 15-07-2017. Click Here For District e-Governance Society Dhamtari Official Notification Link. Bihar State Educational Infrastructure Development Corporation Ltd is ready to hire the applicants for the 01 available seats of Consultant Structure Jobs as per the BSEIDC Recruitment 2017 advertisement published on department web portal. Job seekers who have required eligibility may apply through Offline Mode after reading all the details of BSEIDC Recruitment 2017 through this section.You are needed to send the application form in the appropriate format at the below address till or before 17th July 2017. Education Needed : Candidates who are willing to apply for BSEIDC jobs must posses Engineering Degree / Post Graduation Degree from any recognized board or institution. Job hunters belonging to SC/ ST/ PH/ BPL Family Category are exempted from such payment of processing fee. The candidates who wish to apply for the available vacancy should not be more than 65 Years As On 01-06-2017. Reserved category applicants will get the age relaxation as per BSEIDC norms. Emoluments given to Employee: Contenders who will be appointed successfully for BSEIDC Vacancy, they get the salary pay band of Rs. 45,000/-. as per organization norms. Application Has To Be Sent Latest By : 17-07-2017. Click Here For BSEIDC Official Notification Link. Tirumala Tirupati Devasthanams is ready to hire the applicants for the 25 available seats of Rigvedam, Sastra Pandit, Care Takers Jobs as per the TTD Recruitment 2017 advertisement published on department web portal. Job seekers who have required eligibility may apply through Offline Mode after reading all the details of TTD Recruitment 2017 through this section.You are needed to send the application form in the appropriate format at the below address till or before 31st July 2017. Education Needed : Candidates who are willing to apply for TTD jobs must posses Post Graduation Degree from any recognized board or institution. Reserved category applicants will get the age relaxation as per TTD norms. Emoluments given to Employee: Contenders who will be appointed successfully for TTD Vacancy, they get the salary pay band of Rs. 18,000/- (Veda, Prabandha, Agama, Smarta and Sastra Pandits), Rs. 15,000/- (caretakers) as per organization norms. Click Here For TTD Official Notification Link. Vijayanagara Sri Krishnadevaraya University is ready to hire the applicants for the 121 available seats of Guest Faculty Jobs as per the VSKUB Recruitment 2017 advertisement published on department web portal. Job seekers who have required eligibility may apply through Offline Mode after reading all the details of VSKUB Recruitment 2017 through this section.You are needed to send the application form in the appropriate format at the below address till or before 30th June 2017. Education Needed : Candidates who are willing to apply for VSKUB jobs must posses Post Graduation Degree from any recognized board or institution. Job hunters belonging to SC/ ST/ Cat-I Category & interested to apply for above posts they need to be paid Processing fee of 200/-. Reserved category applicants will get the age relaxation as per VSKUB norms. Emoluments given to Employee: Contenders who will be appointed successfully for VSKUB Vacancy, they get the salary pay band of Rs. 25,000/- (NET/K-SET), Rs. 15,000/- (NET/Ph.D) as per organization norms. Click Here For VSKUB Official Notification Link. State Co-Operative Election Authority is ready to hire the applicants for the 30 available seats of Advocate Jobs as per the State Co-Operative Election Authority Recruitment 2017 advertisement published on department web portal. Job seekers who have required eligibility may apply through Offline Mode after reading all the details of State Co-Operative Election Authority Recruitment 2017 through this section.You are needed to send the application form in the appropriate format at the below address till or before 28th July 2017. Education Needed : Candidates who are willing to apply for State Co-Operative Election Authority jobs must posses Graduation Degree (Law) from any recognized board or institution. The candidates who wish to apply for the available vacancy should not be more than 58 Years. Reserved category applicants will get the age relaxation as per State Co-Operative Election Authority norms. Application Has To Be Sent Latest By : 28-07-2017. Click Here For State Co-Operative Election Authority Official Notification Link. Centre For Cellular & Molecular Biology is ready to hire the applicants for the 09 available seats of Scientist Jobs as per the CCMB Recruitment 2017 advertisement published on department web portal. Job seekers who have required eligibility may apply through Online Mode after reading all the details of CCMB Recruitment 2017 through this section.Candidates who meet the eligibility criteria and interested to apply they can submit their application form before the last date that is 24th July 2017. Education Needed : Candidates who are willing to apply for CCMB jobs must posses Post Graduation Degree from any recognized board or institution. Job hunters belonging to PH/ ST/ SC/ Women/ Abroad Candidate/ CSIR Employees Category are exempted from such payment of processing fee. The candidates who wish to apply for the available vacancy should not be more than 32 Years (Post 1,2), 37 Years (Post 3). Reserved category applicants will get the age relaxation as per CCMB norms. Emoluments given to Employee: Contenders who will be appointed successfully for CCMB Vacancy, they get the salary pay band of Rs. 87,107/- (Post 1,2), Rs. 97,262/- (Post 3) as per organization norms. Commencement of Online Application Form Is : 24-06-2017. Last Date For Applying Online Is : 24-07-2017. Last date to submit application form : 09-08-2017. Click Here For CCMB Official Notification Link. Employees State Insurance Corporation is ready to hire the applicants for the 08 available seats of Attendant, Health Educator, Nurse Jobs as per the ESIC Bangalore Recruitment 2017 advertisement published on department web portal. Job seekers who have required eligibility may apply after reading all the details of ESIC Bangalore Recruitment 2017 through this section.Candidates who have decided to build their career in this organization they can attend Walkin Interview which are going to be held On 5th July 2017. Education Needed : Candidates who are willing to apply for ESIC Bangalore jobs must posses 10th / 12th / Graduation Degree / Post Graduation Degree from any recognized board or institution. The candidates who wish to apply for the available vacancy should be existing between 21 - 30 Years (Post 1), 21 - 35 Years (Post 2-3). Reserved category applicants will get the age relaxation as per ESIC Bangalore norms. Emoluments given to Employee: Contenders who will be appointed successfully for ESIC Bangalore Vacancy, they get the salary pay band of Rs. 5200 - 20,200/- (Post 1), Rs. 9,300 - 34,800/- (Post 2-3) plus Grade Pay of Rs. 2400/- (Post 1), Rs. 4200/- (Post 2), Rs. 4800/- (Post 3) as per organization norms. Walk In Date : 05-07-2017. Click Here For ESIC Bangalore Official Notification Link. Collector Office Korba is ready to hire the applicants for the 18 available seats of PGT, TGT Jobs as per the Collector Office Korba Recruitment 2017 advertisement published on department web portal. Job seekers who have required eligibility may apply through Offline Mode after reading all the details of Collector Office Korba Recruitment 2017 through this section.You are needed to send the application form in the appropriate format at the below address till or before 30th June 2017. Education Needed : Candidates who are willing to apply for Collector Office Korba jobs must posses Graduation Degree / Post Graduation Degree from any recognized board or institution. The candidates who wish to apply for the available vacancy should be existing between 21 - 30 Years As On 01-01-2017. Reserved category applicants will get the age relaxation as per Collector Office Korba norms. Emoluments given to Employee: Contenders who will be appointed successfully for Collector Office Korba Vacancy, they get the salary pay band of Rs. 200/- (Post Graduate PGT per Period), Rs. 150/- (Graduate TGT per Period) as per organization norms. Click Here For Collector Office Korba Official Notification Link. Tidel Park Coimbatore LTD is ready to hire the applicants for the Various available seats of Assistant Manager, Technical Assistant Jobs as per the TPCL Recruitment 2017 advertisement published on department web portal. Job seekers who have required eligibility may apply through Offline Mode after reading all the details of TPCL Recruitment 2017 through this section.You are needed to send the application form in the appropriate format at the below address till or before 13th July 2017. Education Needed : Candidates who are willing to apply for TPCL jobs must posses Diploma / Engineering Degree from any recognized board or institution. The candidates who wish to apply for the available vacancy should not be more than 45 Years (Post 1), 40 Years (Post 2) As On 01-06-2017. Reserved category applicants will get the age relaxation as per TPCL norms. Emoluments given to Employee: Contenders who will be appointed successfully for TPCL Vacancy, they get the salary pay band of Rs. 28,000/- (Post 1), Rs. 20,000/- (Post 2) as per organization norms. Last Date of Receipt of Applications : 13-07-2017. Click Here For TPCL Official Notification Link. Andhra Pradesh Urban Finance And Infrastructure Development Corporation is ready to hire the applicants for the 03 available seats of PPP Expert, Architect Jobs as per the APUFIDC Recruitment 2017 advertisement published on department web portal. Job seekers who have required eligibility may apply through Offline Mode after reading all the details of APUFIDC Recruitment 2017 through this section.You are needed to send the application form in the appropriate format at the below address till or before 3rd July 2017. Education Needed : Candidates who are willing to apply for APUFIDC jobs must posses Graduation Degree / Engineering Degree / Post Graduation Degree from any recognized board or institution. Reserved category applicants will get the age relaxation as per APUFIDC norms. Click Here For APUFIDC Official Notification Link. Flood And River Erosion Management Agency Of Assam is ready to hire the applicants for the 06 available seats of Rehabilitation Officer, Procurement Specialist Jobs as per the FREMAA Recruitment 2017 advertisement published on department web portal. Job seekers who have required eligibility may apply through Offline Mode after reading all the details of FREMAA Recruitment 2017 through this section.You are needed to send the application form in the appropriate format at the below address till or before 1st July 2017. Education Needed : Candidates who are willing to apply for FREMAA jobs must posses Engineering Degree / Post Graduation Degree from any recognized board or institution. The candidates who wish to apply for the available vacancy should be existing between 21 - 43 Years As On 01-01-2017 (Post 3-6). The candidates who wish to apply for the available vacancy should not be more than 64 Years (Post 1,2). Reserved category applicants will get the age relaxation as per FREMAA norms. Emoluments given to Employee: Contenders who will be appointed successfully for FREMAA Vacancy, they get the salary pay band of Rs. 50,000/- (Post 1-4), Rs. 45,000/- (Post 5,6) as per organization norms. Last Date for the Submission of Application : 01-07-2017. Click Here For FREMAA Official Notification Link. Swachh Bharat Mission (Gramin) Chhattisgarh is ready to hire the applicants for the 44 available seats of District Coordinator & Consultant Jobs as per the Swachh Bharat Mission (Gramin) Chhattisgarh Recruitment 2017 advertisement published on department web portal. Job seekers who have required eligibility may apply through Offline Mode after reading all the details of Swachh Bharat Mission (Gramin) Chhattisgarh Recruitment 2017 through this section.You are needed to send the application form in the appropriate format at the below address till or before 20th July 2017. Education Needed : Candidates who are willing to apply for Swachh Bharat Mission (Gramin) Chhattisgarh jobs must posses Diploma (PG) / Post Graduation Degree from any recognized board or institution. The candidates who wish to apply for the available vacancy should be existing between 21 - 45 Years As On 01-07-2017. Reserved category applicants will get the age relaxation as per Swachh Bharat Mission (Gramin) Chhattisgarh norms. Emoluments given to Employee: Contenders who will be appointed successfully for Swachh Bharat Mission (Gramin) Chhattisgarh Vacancy, they get the salary pay band of Rs. 40,000/- (Post 1), Rs. 30,000/- (Post 2) as per organization norms. Application Has To Be Sent Latest By : 20-07-2017. Click Here For Swachh Bharat Mission (Gramin) Chhattisgarh Official Notification Link. Indian Council of Historical Research is ready to hire the applicants for the 02 available seats of Consultant Jobs as per the ICHR Recruitment 2017 advertisement published on department web portal. Job seekers who have required eligibility may apply through Offline Mode after reading all the details of ICHR Recruitment 2017 through this section.You are needed to send the application form in the appropriate format at the below address till or before 5th July 2017. Education Needed : Candidates who are willing to apply for ICHR jobs must posses Graduation Degree / Post Graduation Degree from any recognized board or institution. Reserved category applicants will get the age relaxation as per ICHR norms. Emoluments given to Employee: Contenders who will be appointed successfully for ICHR Vacancy, they get the salary pay band of Rs. 30,000/- as per organization norms. Last date to submit application form : 05-07-2017. Click Here For ICHR Official Notification Link. Indo German Tool Room is ready to hire the applicants for the 14 available seats of Engineer Jobs as per the IGTR Recruitment 2017 advertisement published on department web portal. Job seekers who have required eligibility may apply through Offline Mode after reading all the details of IGTR Recruitment 2017 through this section.You are needed to send the application form in the appropriate format at the below address till or before 24th July 2017. Education Needed : Candidates who are willing to apply for IGTR jobs must posses Engineering Degree from any recognized board or institution. The candidates who wish to apply for the available vacancy should not be more than 35 Years (Post 1-3), 30 Years (Post 4,5). Reserved category applicants will get the age relaxation as per IGTR norms. Emoluments given to Employee: Contenders who will be appointed successfully for IGTR Vacancy, they get the salary pay band of Rs. 15,600 - 39,100/- With 5400/- Grade Pay (Post 1,2), Rs. 9300 - 34,800/- With 4200/- Grade Pay (Post 3-5) as per organization norms. Click Here For IGTR Official Notification Link. Shaheed Sukhdev College of Business Studies is ready to hire the applicants for the 10 available seats of Assistant Professor Jobs as per the SSCBS Recruitment 2017 advertisement published on department web portal. Job seekers who have required eligibility may apply through Online Mode after reading all the details of SSCBS Recruitment 2017 through this section.Candidates who meet the eligibility criteria and interested to apply they can submit their application form before the last date that is 6th July 2017. Education Needed : Candidates who are willing to apply for SSCBS jobs must posses Post Graduation Degree from any recognized board or institution. Job hunters belonging to PH/ ST/ SC/ Women Category are exempted from such payment of processing fee. Reserved category applicants will get the age relaxation as per SSCBS norms. Emoluments given to Employee: Contenders who will be appointed successfully for SSCBS Vacancy, they get the salary pay band of Rs. 15,600 - 39,100/- plus 6000/- Grade Pay as per organization norms. Last Date To Submit Online Application : 06-07-2017. Click Here For SSCBS Official Notification Link. Metal Scrap Trade Corporation Limited is ready to hire the applicants for the 07 available seats of Manager Jobs as per the MSTCL Recruitment 2017 advertisement published on department web portal. Job seekers who have required eligibility may apply through Online Mode after reading all the details of MSTCL Recruitment 2017 through this section.Candidates who meet the eligibility criteria and interested to apply they can submit their application form before the last date that is 22nd July 2017. Education Needed : Candidates who are willing to apply for MSTCL jobs must posses Post Graduation Degree / Diploma from any recognized board or institution. The candidates who wish to apply for the available vacancy should not be more than 45 Years (Post 1), 40 Years (Post 2), 38 Years (Post 3), 34 Years (Post 4) As On 30-06-2017. Reserved category applicants will get the age relaxation as per MSTCL norms. Emoluments given to Employee: Contenders who will be appointed successfully for MSTCL Vacancy, they get the salary pay band of Rs. 43,200 - 66,000/- (Post 1), Rs. 36,600 - 62,000/- (Post 2), Rs. 32,900 - 58,000/- (Post 3), Rs. 24,900 - 50,500/- (Post 4) as per organization norms. Opening Date of Online Registration of Application Form Is : 08-07-2017. Online Application Will Be Received Till : 22-07-2017. Click Here For MSTCL Official Notification Link. Institute of Bioresources and Sustainable Development is ready to hire the applicants for the 21 available seats of Research Fellow, Field Assistant Jobs as per the IBSD Recruitment 2017 advertisement published on department web portal. Job seekers who have required eligibility may apply through Offline Mode after reading all the details of IBSD Recruitment 2017 through this section.You are needed to send the application form in the appropriate format at the below address till or before With In 21 Day's. Education Needed : Candidates who are willing to apply for IBSD jobs must posses 12th / Graduation Degree / Post Graduation Degree from any recognized board or institution. The candidates who wish to apply for the available vacancy should not be more than 28 Years (Post 1), 30 Years (Post 2), 35 Years (Post 3). Reserved category applicants will get the age relaxation as per IBSD norms. Emoluments given to Employee: Contenders who will be appointed successfully for IBSD Vacancy, they get the salary pay band of Rs. 25,000/- (Post 1), Rs. 13,000/- (Post 5), Rs. 10,000/- (Post 6), Rs. 16,000/- (Post 4), Rs. 28,000/- (Post 2), Rs. 36,000/- & 40,000/- (Post 3) as per organization norms. Last Date for the Submission of Application : With In 21 Day's. Click Here For IBSD Official Notification Link.